5793 labyrinths found. Showing 4261-4280. Sorted by country, state, city, then zip/postal code. Cream Ridge Road is off Atlantic Avenue (Rte 286) in the town of Walworth. The labyrinth is right by the road and anyone is welcome to stop and walk it at any time. 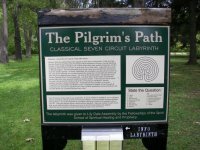 Located in southern Westchester County, New York, the St. Thomas labyrinth welcomes all visitors. Eight miles east of village of East Aurora, NY. Different style labyrinths built each time. From the Quickway (Route 17) Take Route 211 from Middletown (near the Galleria Mall) West towards Montgomery. As you're heading out of town and you pass Casa Mia on the right, start looking for the bus shelter on the left at Camp Orange Road. Make the left onto Camp Orange Road, drive to the end of the road, and take the dirt road on the right -- this is Prospect Road. Abundant Life Farm and the Labyrinth are on the right, about a mile down the road. The property is clearly marked with signs. Go over railroad tracks, take left on Navy Rd. Go all the way to end to parking lot. Its on the grass to the left of the dock. Located behind the former Mountaindale High School. The labyrinth itself is wheel chair friendly, but there is a slight incline on the path leading to the labyrinth. 41.4122 N	° Lat. ; 74.3153 W° Long. 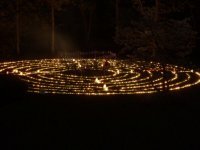 The Unity Labyrinth is seven circuits with a circular center. Grass and clover path delineated with local stone. The Heritage Labyrinth is located at the entrance to the school. Public parking is available at the town park across the road. Please do not park on the lawn by the labyrinth. Because the labyrinth is located on school grounds, it would appropriate to visit it after school hours or on weekends during the school year. Permanent terrazo labyrinth available to the public for walking. It is open for walking on the first Sunday of each month from 1:00 to 3:00 pm and every Wednesday from 5:00 to 6:00 pm and 7:30 to 8:30 pm. In addition to scheduled liturgical events, the St. Paul's Chapel labyrinth is open to the public on the 3rd Thursday of every month, 2:00-6:00 pm. East River Park, Houston St. It is available and has been since 2004. The city requires it to be categorized as temporary. Entrance to the Park is at the foot of Houston St. where you cross the FDR drive. The labyrinth is to the right or south of this entrance. Also approachable from several other areas off the East river esplanade.